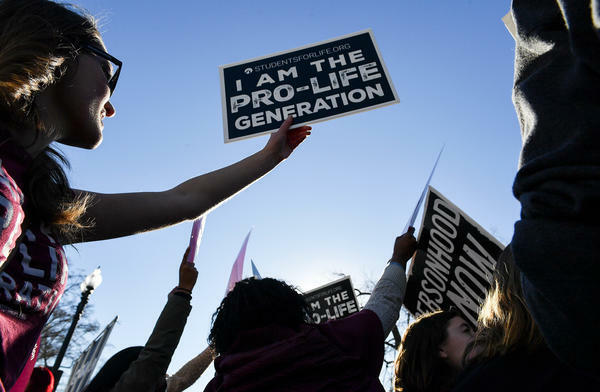 Opponents of abortion rights rallied outside the U.S. Supreme Court during The March for Life on Friday in Washington, D.C. Indeed, on Friday, as anti-abortion protesters gathered in Washington for the 45th annual March for Life, the Trump administration announced two new policies. One is a letter to states aimed at making it easier for them to exclude Planned Parenthood facilities from their Medicaid programs; the other is a proposed regulation to allow health care providers to refuse to perform services that conflict with their "religious or moral beliefs." "In my administration, we will always defend the very first right in the Declaration of Independence, and that is the right to life," President Trump said in a video address from the Rose Garden to the marchers. Marjorie Dannenfelser, president of the anti-abortion group the Susan B. Anthony List, led the Trump campaign's Pro-Life Coalition. The then-candidate said he was committed to "nominating pro-life justices to the U.S. Supreme Court," which happened with the nomination and confirmation of Justice Neil Gorsuch in April. Despite many attempts, Congress did not pass a federal ban on abortions occurring after 20 weeks, didn't cut off Planned Parenthood's federal funding and didn't write into permanent law the Hyde Amendment, which bans most federal abortion funding but needs annual renewal. Still, there was progress on scaling back abortion and, in some cases, access to contraception at the federal level. The administration made myriad changes. It reinstituted and expanded the "Mexico City" policy, which forbids funding of international aid programs that "perform or promote" abortion. It issued rules aimed at allowing religious-affiliated and other employers to not offer contraceptive services if they have a "religious belief" or "moral conviction" against them, although federal courts have blocked the new rules from being implemented. And just last week the administration created a new "conscience and religious freedom" division in the Department of Health and Human Services' Office of Civil Rights. That new division is designed to enforce both existing laws protecting the rights of conscience for medical personnel as well as the new regulations. Most important, according to many in the anti-abortion movement, the president nominated and the Senate confirmed a dozen and a half federal district court and appeals court judges who are considered likely to rule in their favor. Abortion rights supporters concede that while the priorities on their opponents' wish list weren't accomplished, plenty still happened. "This administration is the worst we've ever seen for women and families," says Kaylie Hanson Long of NARAL Pro-Choice America in a statement. "Its attacks on reproductive freedom are relentless, under the radar, and aren't supported by the majority of Americans who believe abortion should remain legal." Dannenfelser says one of the biggest changes is the number of anti-abortion advocates now working in the Department of Health and Human Services in key roles. "I can say there is more unity in this administration than there has been in any presidency on this," she says. Abortion opponents know their biggest obstacle is the Senate, where they don't have the 60 votes required for most legislation. "Without making advances in the Senate, it's going to be really tough," says Dannenfelser. Meanwhile, outside Washington, states continued their efforts to restrict access to abortion and family planning. States have passed 401 separate measures since Republicans took over most state legislatures in 2011, according to the Guttmacher Institute, a reproductive rights research and advocacy group. During 2017, 19 states enacted 63 separate restrictions, says Elizabeth Nash, who tracks state legislation for Guttmacher. Among the notable laws was one in Ohio to outlaw abortions of fetuses diagnosed with Down syndrome. Arkansas and Texas passed laws to ban "dilation and evacuation" abortions, a procedure that uses suction and medical instruments to remove the fetus and is the most common procedure for abortion after the first trimester of pregnancy. Both bans have been blocked by federal courts. Some of the new restrictions came from states that haven't been active on the issue in recent years. A Wyoming law requiring ultrasounds to be offered to pregnant women seeking an abortion was that state's first in 30 years, Nash says. But 2017 was also notable for states seeking to widen or ensure access to abortion and other reproductive services. For example, Delaware passed a law enshrining abortion rights, while Oregon and New York require private health plans to cover abortion without patients' cost sharing. Legislators in California, which has a long history of protecting abortion rights, have been pushing a bill that would require public universities to provide abortion pills to female students who are less than 10 weeks pregnant. The bill stalled last year, but it is being picked up again this year. As a result, says Nash, "we are really living in a bifurcated country. The states that are progressive are looking to protect access" to abortion and contraception. "The states that are conservative are looking to restrict it." In other words, a nation that looks a lot like it did 45 years ago, when the Supreme Court legalized abortion nationwide in Roe v. Wade. Kaiser Health News is a national health policy news service. It is an editorially independent program of the Henry J. Kaiser Family Foundation. California Healthline reporter Ana B. Ibarra contributed to this story.